Cisco SPA502G is a reliable VoIP phone featuring both SIP and Cisco’s proprietary SPCP protocol. This phone supports a wide variety of call features and functions, including plenty of options for customizing the device. The dual Ethernet ports behind the phone support PoE for powering the device. 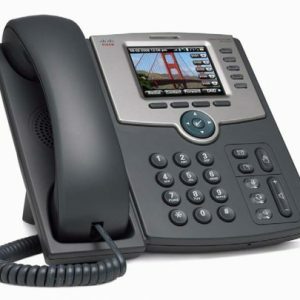 The Cisco SPA502G phone can be expanded via available expansion modules. Or plug in a headset to the 2.5mm jack. The onboard speakerphone is perfect for local 3-way conferencing. Wideband audio offers high-quality voice and audio performance.